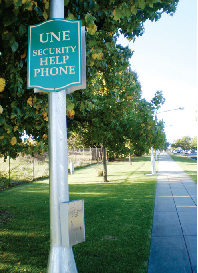 Help Phones are positioned in prominent places around campus. Most can be found attached to light poles like the one in the photo below. Others can be found in our computer labs, car parks & lifts. Should you require assistance simply press for the button for a direct connection to Safety & Security. However in the case of some lifts, the call is answered by the lift company who will in turn contact Safety & Security if required.